We are always in the market for new proxy service providers to help us manage our SEO software. As you may already know, proxies are not usually the most consistent things in the world, and switching between service providers is part and parcel of life as an internet marketer. However, we have been hearing great things about Blazing Proxies, so we decided to give them a go to see if we have found another provider to add to our arsenal. To make your decision easier, we will dive straight into the details that you are most likely interested in: their price, performance and support responsiveness. Blazing Proxies Price – Are They Justified? What Are the Proxies Like? What Features Do They Provide? How Long Was the Set Up Time? How Was the Support System? Before we dive into the specifics in regards to their speed and performance, it’s clear from the start that Blazing Proxies are not employing any sort of premium pricing strategy with their proxies. We purchased the 25 private proxy package, which costed us just $29 per month, giving each proxy a price tag of just $1.16. That’s right on par with the majority of the other service providers that we use. As you slide further up the scale, the price drops down considerably, with the cheapest coming in at just $0.90 per proxy. 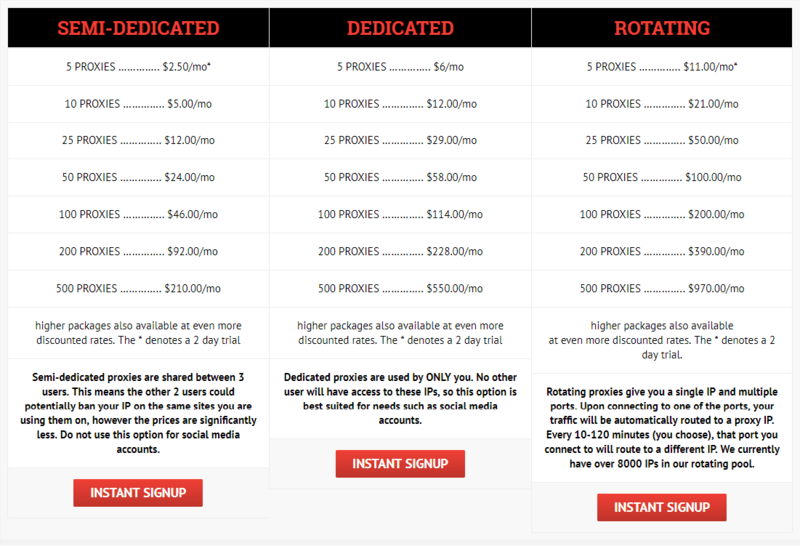 It’s worth bearing in mind, however, that this pricing structure is for the dedicated proxies that they offer. They also offer semi-dynamic proxies (a posh name for shared) and rotating IP proxies. Either way, the price is reasonable, especially considering the quality of them, which we will get into next. As we mentioned in the introduction to this review, we generally use proxies for SEO software such as Scrapebox, GSA SER and SENuke, so there are certain features that we like to see in the proxies that we use. The biggest concern for us when purchasing new proxies is whether or not they allow unmetered bandwidth usage and unlimited threading. Running SEO software without these features can be incredibly slow and unproductive. Luckily, all of Blazing Proxies proxies are completely free of limits, giving you the freedom to attack your campaigns with as much aggression as you see fit. In terms of speeds, the proxies are running on Gigabit lines (1000mb/s) so they are incredibly fast straight out without any tweaking required. Apparently, every single proxy is hosted on servers owned by the company, giving them ultimate control over them. This was definitely evident in the speeds that we were seeing with these things. Another cool feature that should be standard across the entire industry in our opinion is an automated refresh at the end of the month. No need to send an email to their support, just login to your dashboard and refresh a single proxy or your entire list in a matter of seconds. This was a handy feature that we loved using. Being experts in our industry (or so we like to think), we understand that waiting for proxies to be set up can take time. We are used to this, so we have the patience to wait a few days for our proxies to be set up manually and correctly. However, some people, especially those who are new and eager to get started will not fancy waiting 24 – 48 hours for their proxies to be set up, so they tend to gravitate towards the “instant delivery” providers that are popping up all over the internet nowadays. The problem with a lot of those companies is the fact that instant delivery is their only selling point, and it’s their only selling point because their proxies are poor. With that being said, Blazing Proxies, having full control of their own servers are able to deliver high quality proxies instantly, without having to wait the 48 hours that we have come to expect from our favourite providers. This was refreshing and a welcomed benefit of using them. We would recommend them to friends for this feature alone. We sent 2 emails to test the responsiveness of the support. One was responded to within 2 hours and the other one was responded to the following morning. Either way, we were extremely pleased with the speed of reply and the overall helpfulness of their representatives. The support system gets a 9/10 from us. We were pleasantly surprised with how much we enjoyed reviewing this service. It’s not hard for us to admit that Blazing Proxies is one of the best companies that we have ever worked with, not just for the quality of their proxies (which are fantastic) but for the overall experience and customer support. If you are in the market for a new proxy service provider and you don’t know where to turn to, we would highly recommend that you check out Blazing Proxies (Blazingseollc.com).